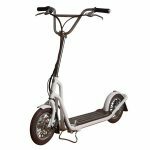 The Kumpan 1950 is a rechargeable pedal scooter with a top speed of 15 miles per hour and a range of up to 25 miles. It’s classy and stylish design doesn’t mess around and stays true to the original scooter form. Though the Kumpan 1950 only weighs 30 pounds, it can carry 240 pounds. This is an elegant option in the realm of adult electric scooters. I think this scooter looks so classy! Only downside is the size of it – not great for anyone who needs to store their scooter in a small place or take it on a train.